Well here we are with something a little different, an interview with the author Keith R. A. DeCandido. In Continuum the second of the two straight the DVD movies that MGM produced for the Stargate we get closure of the Goa’uld storyline which goes all the ways back to Ra at least in terms of the tv aspect of the franchise. Ba’al has been captured and all his clones are dead but he seems rather confident that the Tok’ra procedure to remove the symbiont is not the last this galaxy will see of him and then people start vanishing one after another. General O’Neill rushes Ba’al who then stabs him with the extraction device and as Jack is dying orders SG1 to get to the Stargate. They emerge into a very cold location which is revealed to be a small freighter encased in ice, the name is familiar to Mitchell but first requirement is to get our of this deep freeze. 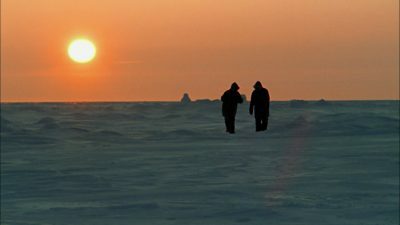 They gain access to land to find the ship had been trapped in ice but Daniel in the attempt has soaked his foot in water which has brought on frostbite, unable to travel Sam and Cameron leave him behind. Well what a fantastic way to close out the journey of SG1. The movie was exceptional in production and story terms as well as making extensive use of existing characters even if only used for cameo sake. We all thoroughly enjoyed the movie watching experience and even though Stargate continues with Atlantis for a time and then Universe for a couple of years we left without a heavy heart, Continuum was a good way to wrap things up. After SG1 ended it’s television run MGM decided to invest in two straight to DVD movies, the first was The Ark Of Truth. In this movie we learn that the Ancients long before they arrived in the Milky Way Galaxy had developed a weapon of sorts which would destroy the power base of the Ori in effect making them too weak to oppose them. It was however decided that taking away free will from millions of people was not a price the Ancients were willing to pay so they hide the Ark and left their home galaxy. Daniel and SG1 have found clues to its where abouts and are digging on Dakara when they are captured by Tomin and his men, the Prior orders their death despite their surrender and Tomin objects. The anti-prior device is working and the Prior gets killed, this combined with Tomin’s own doubts over his actions causes him to surrender to SG1 and return to the SGC. The IOA and SGC agree on a plan to visit the ORI galaxy and find the Ark and Marrick is sent along as the IOA representative, his past includes black op missions for the CIA so we know something is going to kick off. When Cameron puts his faith in the Ark and doesn’t immediately act upon the supergate Marrick uses the Asgard Core to replicate a replicator with advanced programming, of course it gets loose so the Odyssey has to fight off little pesky buggers as well as four very big pesky buggers in the guise of Ori starships. Meanwhile the team on the planet find the Ark and are then attacked, Teal’c is seriously wounded and his companions are captured and taken to Celestis where they are tortured and Adria reveals herself to be the recipient of all the power of the ORI faith. The Ark Of Truth had a larger budget than say a two part episode of Stargate SG1 and that is pretty evident from the word go however the majority of the story is shot on the existing stages and you can not really hide that fact. One other benefit of a higher budget and more time to play around with is the longer CGI sequences, seeing the Odyssey fly by or enter the stargate over a longer period of time adds so much to the feel and texture of the movie, not quite theatrical but so much more than tv. We also got some cameos and returning guest actors reprising their roles, again you can underestimate that aspect when making a serial show which relies on continuity to bring the fanbase into the fold. There were some nice twists in the story although most of it had been hinted at in the final season of SG1 but it’s no surprise, this first movie was all about wrapping up the ORI storyline and it was always going to be a hail mary that achieved the almost impossible. It has to be said that the final product was very satisfying both in the story telling and the overall production and knowing Continuum is on the way makes the end of SG1 a little easier to accept. Many thanks to Andrew for joining us in watching and chatting about The Ark Of Truth and he will return next week for Continuum in which Ba’al makes a return along with many other familiar faces in a final goodbye for this part of the franchise. 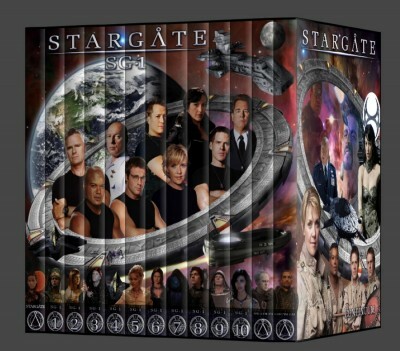 We would love to hear from you on any Stargate or Gatecast related subject so don’t be shy. 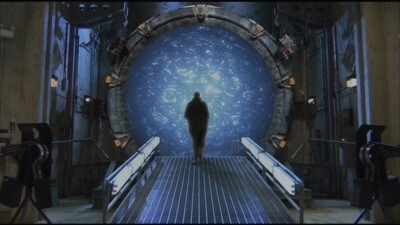 The Final Cut was a worthy addition to the Stargate family, interesting to see some of the reasoning behind the changes. So have a listen and then let us know what you thought about our wrap up comments, the season as a whole and any individual episode within, we would love to hear from you. 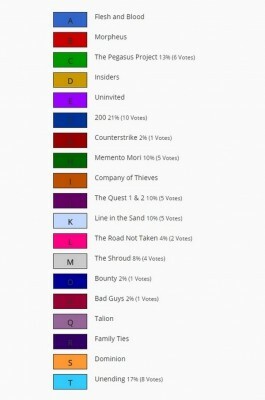 We’d also like to thank Thomas, Brad, Adrianna, Andrew, Dan, Misa and Jeff for joining us on episodes from the tenth season, goes without saying you all helped to make the show better:) The Atlantis season 4 schedule is up (link at the top of the page) and there are plenty of episodes left so if you fancy joining us over skype to watch an episode and have a good chat about it then please get in touch. 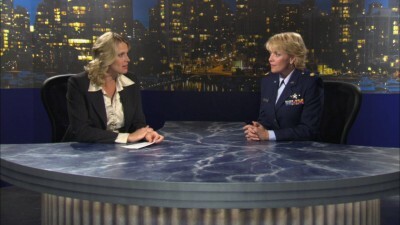 We have a number of promos featured in this episode (listed below) so please have a listen, you may find these podcasts interesting and next week we are back into the week by week coverage of the show proper which means Stargate Atlantis for the next year and a bit as we kick off with the Season 4 premiere “Adrift”. The Odyssey with General Landry and SG1 onboard travel to the Asgard homeworld where Thor informs them that as a race they are no longer able to resist the ravages of time, their cloning technology has hit a critical juncture and with no future capability to sustain their forms and no way to ascend they as a species have decided to remove their world and themselves from existence. Their final parting gift to the humans who for the most part they accept as the Fifth race is the fruits of their technology, every scrap of data is incorporated into a core piece of tech which they retrofit to the Odyssey and for the first time a human ship has the full resources of the Asgard military. As it turns out pretty sweet timing as ORI starships jump into the system and as the Asgard world is vaporised the Odyssey engages the ORI and proves victorious and jumps into hyperspace for the return to Earth. This weeks promo was for the SciFi Diner podcast an excellent show with lots of interviews and features, well worth a listen and thanks for all the support for our coverage of Stargate SG1, the two movies will be covered in due time and in the short term we have the Stargate Atlantis S3 finale next week and then the two wrap up shows. After that we jump into the fourth season of Atlantis and there are still episodes open if you fancy joining us on the show, check the schedule and get in touch. An epic plan devised by Vala leads to the capture of Adria by Ba’al which wasn’t really the idea but hey the best laid plans and all that. Well fooling Adria into believing Vala had been turned against by the SGC after they suspected her of being under the influence of Adria worked well and of course getting Adria to the location of the trap was flawless but no one expected the Jaffa of Ba’al to crash the party. Of course it gets worse as Ba’al looks to use Adria as an uber host and once under his control he would have full access to the armies of the Ori but it doesn’t turn out too badly when SG1 and the Odyssey launch a covert attack and kill Ba’al (which makes about a dozen dead clones this episode) but they were too late, Ba’al and Adria are one, creepy. This weeks promo is for Generations Geek a father/daughter podcast which looks at movies, television, events with lots of interviews, excellent show. Next week we are going to be taking a look at the Stargate Atlantis episode Vengeance and we have a first time guest, hope you tune in and don’t forget that we’d love to hear what you think about anything Stargate. Vala gets an unexpected message from off world, her father long the bane of her life is offering the SGC a deal on the information he claims to have about the location of a cloaked cargo ship equipped with Naquadah and intended for a first strike against Earth. When this information proves reliable he is granted sanctuary on Earth but his inherent need to exploit and con people comes to the fore and faced with increasing displeasure he offers to deal with a band of Jaffa who have Naquadah and are still on Earth but he would have to be part of the operation as there is a failsafe built in and only he can disarm it. 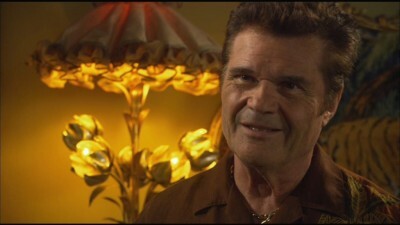 Family Ties while not being written specifically for Fred Willard was tailored to his style once he came on board to play Jacek and it’s hard to imagine anyone portraying the lovable rogue who gave us Vala even if he is by no means a good father and it sounds even less of a good husband. The episode as with a few in the second half of the season feels like it would have served better if earlier in the run, it’s certainly not part of an arc but then I suppose with the ORI put to one side (for now) they really don’t have to go to extremes to set up a season finale since at this point they knew they were cancelled. The set designers get a lot of praise for this episode, they were allowed to a little over the top in presenting us with what Jacek considers high calibre home decoration and in many ways you can see where Vala gets her love of gaudy objects speaking of which it was touching to see that she did indeed treasure the little trinkets he often brought back to her from his travels. The leaders of the Jaffa meet at Dar Eshkalon to discuss the ongoing threat of the ORI military forces within the Milky Way galaxy but soon after Teal’c and Bra’tac arrive a bomb in detonated slaughtering virtually all in attendance. Teal’c was outside the immediate blast zone investigating some suspicious behaviour and thus wasn’t critically injured unlike Bra’tac who is currently sedated within the SGC infirmary. Teal’c shares his suspicions of the Jaffa Bak’al who he has seen at Dar Eshkalon and his master Arkad who has been gathering forces and has shown no honour or allegiance to the mainstream Jaffa nation. 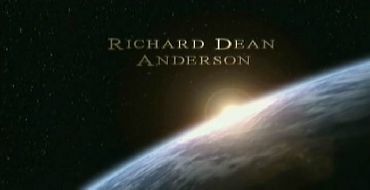 The SGC and IOA are not comfortable with Teal’c going on a mission of revenge so he departs on his investigation alone and begins to find the proof he needs to link the explosives used to Bak’al and Arkad while the SGC are visited by Arkad offering a gesture of peace through information of a plot against the Earth. The IOA are keen to take the road of appeasement and SG1 are ordered to track down Teal’c before he does something which could inflame tensions and force the hand of Arkad but they are too late, Teal’c takes SG1 and SG3 out of the equations and faces Arkad in one on one combat in a spectacularly blood thirsty fashion. You’ll never walk alone, well…. Talion is a masterpiece for Teal’c and Christopher Judge and you’ve got to admit it may only have been possible at the end of the shows run on television, the violence is certainly ramped up and the liberal amounts of blood is splashed about with abandon. We see Teal’c turning down the off the books offer of help from members of SG1 and we wonder if that is not only to safeguard them but to allow him to do what he believes will be necessary, in essence we are going to see Teal’c as he was as the feared first prime of Apophis rather than the more restrained but equally effective member of SG1. Craig Fairbrass, Peter Kent and John Tench all play good characters if a little cliched but that’s exactly what this story requires, you can only do so much in under an hour of television. 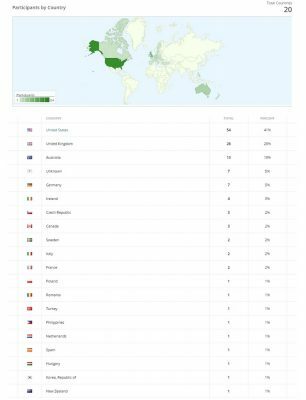 A big thank you to everyone for listening to the show through March, that was the best month for downloads for quite a while and that doesn’t even include Stitcher but we are still not getting a lot of feedback and that normally always cheers us up and of course as most podcasts say reviews and ratings on itunes and Stitcher are pure gold if only to near the top when someone does a search for the topic they cover, in our case Stargate. This weeks podcast promo was for The Batcave Podcast a show which deals mostly with the classic Adam West and Burt Ward series, lots of fun if you like me enjoyed the antics of the dynamic duo. Next week we are going to be looking at the Stargate Atlantis episode Sunday, get the tissues ready and our guest will be Thomas, hope you can join us for that. Daniel discovers the potential location of yet another cache of Ancient artifacts which may or may not include weapons technology, they gate to the location and find themselves in what appears to be a large modern museum which is currently hosting some sort of gala event, they are discovered and in the confusion shots are fired and alarms triggered which seals SG1 and some of the locals inside the structure. Alas to complicate matters the DHD is just a show piece and SG1 have to handle the “hostage” situation without hurting anymore (more than necessary) until such time as the SGC makes contact or they themselves discover a way to power the gate and manually dial out. A lone security guard takes it upon himself to take on and defeat these “rebels” while a museum researcher is vindicated in his belief that the ring device was indeed a means of travel amongst the stars but meanwhile the clock is ticking and this society which seems to be in the midst of political and social struggle have their fingers on the trigger. Bad Guys is another episode that doesn’t quite seem to fit into the headlong dash to the conclusion of the ORI storyline and the wrapping up of the final season of the show, it has the feel of a mid-series episode with some decent action, humour and a few very worthy guest stars. The episode didn’t get a great reception either and Michael was quite critical of his characters actions in the episode but as we found out some heavy editing took place which may have made a significant difference to the overall context of various scenes. Ron Canada, Joshua Malina and Alistair Abell all bring their A game to the episode and make all the difference to what is a rather forgettable episode more so given the high standards of the final season. We’d like to thank Andrew for joining us for the first time on this episode, he was well into the episode and made it far more enjoyable that it would have been otherwise, hopefully he will be back sooner rather than later and if you have the time check out his music, link below. After another very successful raid against the Lucian Alliance their leader Netan places a bounty on SG1 and thanks to them being tagged during the last raid the galaxies premiere bounty hunters are on their way to Earth to collect. Cameron along with Vala are going to his high school reunion, Daniel is deep in some research at a public library, Teal’c is offworld dealing with some Jaffa issues and Sam is attending a technology conference to demonstrate some of the tech she is “working” on. Meanwhile back in Kansas Vala is making quite the impression on John’s parents and to be honest I think she has been accepted by the mother who maybe sees a bit of a kindred spirit but Cameron is dealing with an old crush and a friend who it seems is more than happy to stir things up a bit. Overall Bounty is an excellent episode, lots of action and humour but as we are coming to the end of SG1 you wonder if more time should have been given over to the ORI resolution and fall out but at this point given we did the movie we can’t complain about the writers and cast getting to have some fun. This weeks promo is for the Dune Saga Podcast and next week we are going to be taking a look at the Atlantis episode The Game, hope you join us. Daniel was captured by Adria and now makes his return to the galaxy but he has been converted to a Prior of the ORI and is preaching Origin to a small community, SG1 are aware of this new non violent approach to gathering new worshippers but they are shocked to see that it is Daniel who is leading this new wave of spreading the gospel. They act quickly and beam him onto the Odyssey and immediately stun him and with the anti-prior device and begin to question him about his time with Adria and what exactly are his plans given only he has the specs to the device Merlin created to fight the ORI. 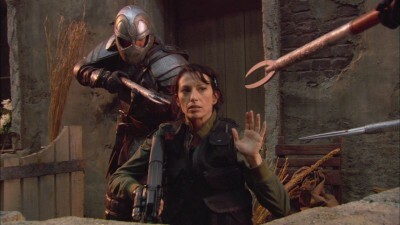 Daniel claims this is all part of his plan and by convincing Adria that he has embraced Origin she would indeed change him into a Prior and the abilities that would give him would in turn be used to build and deliver Merlin’s weapon into the ORI galaxy but with the whole Milky Way at stake the SGC and the IOA are sceptical to say the least. 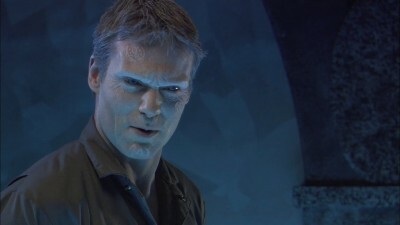 A compromise is given with Daniel giving the location of the ORI starship and SG1 launch a raid to capture the weapon and finish it’s construction but as they battle for their lives it’s Daniel who escapes, kidnaps Jack, steals the Odyssey and rushes to meet up with Adria and the final act of his plan. You can trust this face. The Shroud is an excellent episode of Stargate SG1 with it’s action and drama all tied together with a number of what are talking head scenes but that’s all great character interaction and dialogue, if nothing else Richard Dean Anderson’s final episode of SG1 pays off big time as we get the old Daniel and Jack dynamic back as if the previous two years absence had never happened. 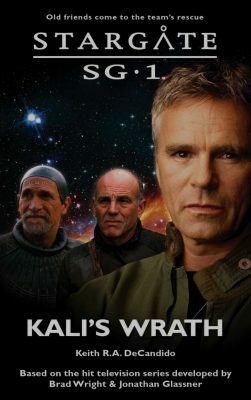 In many ways it’s a gift to the fans, each member of SG1 at least those that spent most of the time with Daniel get to well interrogate and come to their own conclusions and while it seems very much like Daniel is Daniel the powers that be have certainly left enough of a hint that there is more going on. Of course as it turns out Daniel was not providing the whole story and we got the WTF moment when he finally met up again with Adria who then not quite got what she was expecting. The final scenes with the incursion of multiple ORI starships fit very well into the style of the later seasons of SG1 and the ORI arc, it’s a partial win at best and while the power of the ORI has a question mark against it the power of their believers is very real and here right now. This weeks promo is for The Rusted Robot Podcast a show hosted by Shawn and Brigitte which has news, interviews, reviews and just a lot of entertaining chat about all things that entertain fans of science fiction and geeky things in general, you’ll enjoy it. Next week we are going to be looking at the Atlantis episode The Tao of Rodney you know the one where Rodney gets super powers and then looks like his brain will blow up, good times good times as Lucius would have said, hope you join us for that. As always we would love to hear from you, feedback wise it’s a little quiet but Facebook and Google+ are ticking over and the twitter feed is a madhouse for all things Stargate. While Sam is doing an experiment in phasing technology as derived from the technology Merlin left behind and unexpected event occurs and she wakes in an empty lab only to find that things are not as they were, Major Lorne is the leader of SG1 and General Hammond is back in command of the SGC. After interrogation she convinces the General she is there by mistake and while their Sam has been lost they agree to help our Sam return if she in turn helps to prevent an imminent attack on Earth by the ORI by solving the energy generation problem they were working on. Alas that proved impossible so Sam expanded the phasing device to blanket the entire planet and fed with the energy output of the entire United States the planet vanishes and survives the ORI attack but now as a media darling and political pawn Sam is going nowhere. The Road Not Taken is another example of the alternate timeline/reality plot often used in Stargate and it has to be said it’s used a lot because it tends to work very well given the technology and characters we know and love in the series. It’s no surprise that the ORI like the System Lords are front and center for a divergent story line and in this one the Earth has pulled back from the galaxy as a whole and stands alone having missed the opportunities for exploring Pegasus and other revelations that came from ongoing galaxy wide exploration. Of course the reveal of the Stargate during their conflict with Anubis certainly shook things up and that perhaps shows while the disclosure has to be done sooner or later it also has to be handled in a controlled and delicate matter to avoid the panic and civil unrest. Of course the twisting of democracy to give the US president almost limitless power has corrupted things and the use of alien derived tech to crush opposition only shows how broken this Earth is. On the upside we did find out that McKay married Sam and he does seem to be a far more balanced and straight forward individual and of course Hammond remains the military man with his feet firmly in the camp of serving the people not controlling them. Overall a good solid episode if you can ignore how some of the events came to pass, the explanation for the transfer of Sam to the other Earth is a little sketchy and they totally gloss over how she returned but hey still fun and Amanda got to play dress up and boy did she look good. 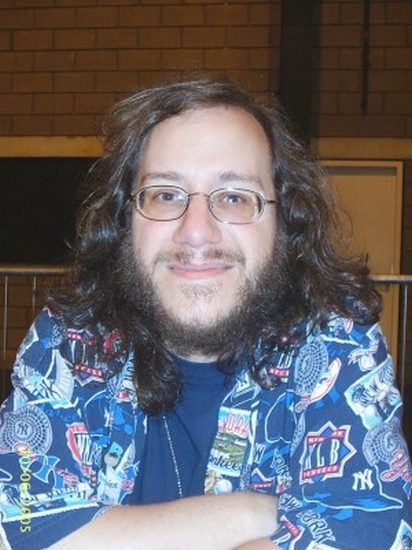 Thanks to Brad for joining us for the show and this weeks promo is for Nutty Bites, next week we are going to be looking at the Stargate Atlantis episode Irresponsible which sees the return of two fan favourite (or maybe not) characters for their final appearances in the franchise, hope you join us for that. In the meantime we would love to hear what you think about the show and maybe if you have the time a review/rating over on itunes or stitcher would be very welcome, Stargate Forever. Sam has been experimenting with phasing technology based on the device Merlin has left behind and with the imminent threat to the people of P9C-882 SG1 are ordered to take the new technology and use it to protect the native population from the ORI. Alas nothing really goes to plan and the assault on the settlement begins and in desperation Sam and Cameron phase a single dwelling and have to watch as the ORI take their wrath out on the locals. Meanwhile Tomin has Vala onboard the ORI mothership in orbit and has been tasked with the process of converting her to Origin, assumption being that Adria has decreed her mother is not to be killed at least not by anyone but herself but the Prior much to Tomin’s displeasure interrupts the word of Origin to support the destruction of the settlement despite some now willing to bow down to Origin. Line In The Sand expands upon some of the Ancient technology the SGC have discovered and given that Merlin was designing such tech to face the threat of the ORI it seems only right and proper thousands of years later it comes to the rescue but while overall the victory went to SG1 the consequences did perhaps tip the balance back to a draw, lives were saved but many lost. That said as many suspected Vala does have influence with Tomin and perhaps her calm and controlled delivery of what is right and proper or more to the point unacceptable no matter the belief system provokes Tomin to confront himself and the Prior when the locals are targeted for destruction. 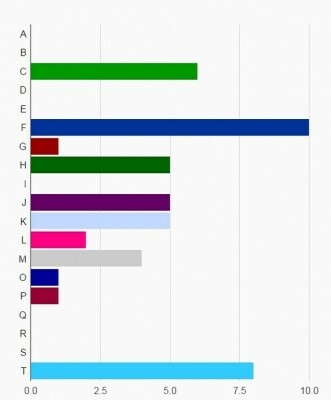 A small victory perhaps but the seeds have been sown and maybe if Tomin can be swayed then so can many more and the united front the ORI appear to offer may start to crumble. 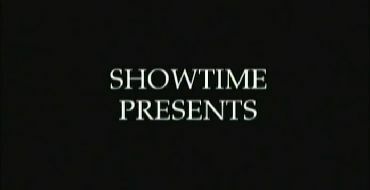 A good action packed episode countered with some great acting from Claudia and Tim, their scenes with quite intense and in a way balanced out the more casual dynamic between a wounded Sam and Cameron as they all watched and waited to see the fate of the local population and an excellent guest appearance by Aisha Hinds as Thilana. This weeks promo was for The Batcave Podcast and next week we’ll be taking a look at the Atlantis episode Echoes and we’d like to thank Brad for joining us this week and sending in the voicemail, very much appreciated. We’d love to hear from you if you have some thoughts on this or other episode of Stargate and of course we are always looking for a guest to come watch and comment on an upcoming episode of SG1 or Atlantis.